This exterior spiral stair kit by Stairways, Inc. is a winner. It is designed to withstand rough conditions in all climates. Galvanizing makes a big difference. Galvanization is a dipping process; it is a tough coating suitable for foot traffic. All spiral stair components are coated inside and out. Exterior spiral stair kits are susceptible to rusting due to the overlapping parts that are required for bolting. Most of these overlapping conditions do not occur on a welded spiral stair by Stairways, Inc. Using a surface coating, such as a wet paint or powder coating, will not solve the problem of rusting but, galvanizing will. If the gray color of galvanizing does not work with your color scheme, a wet paint or powder coating can be applied over the galvanization to add color, and another layer of protection. The spiral stair shown in the photo is code compliant for a secondary stair access. It is available with many step, baluster, and handrail options. 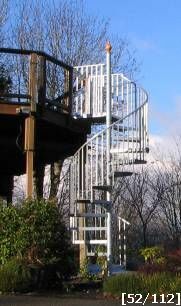 Stairways, Inc. standard bolted spiral stair kits are economical and easy to install. Call and speak to our sales staff to discuss what type of spiral stair model, that Stairways, Inc. offers, that will best complete your project.